Beautiful Heirloom “One of a Kind” Victorian Christmas Tree. This adorable realistic Christmas Tree has been dressed in a Victorian theme of rich reds, greens and golds. 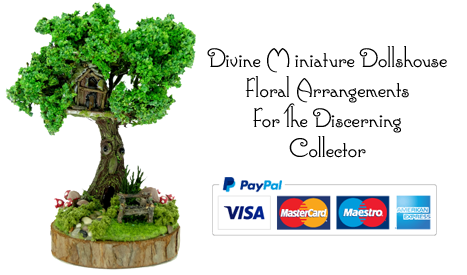 It has been completely handmade by the artist from start to finish, even the tree itself. Having been painstakingly dressed with beautiful handmade red poinsettia blooms, gold plated baubles, red hand decorated baubles, gold plated garland, golden bells, crystal effect drop baubles, frosted jewel hearts, green and gold baubles,all which sway upon movement. This pretty tree as been then topped with a twinkly golden jewel star. The photo does not do this work of art the justice that this stunning tree deserves. 8” high x 4.5” wide PLEASE NOTE: Each one of our tree’s is priced not just the size, but what baubles it is has been dressed with. One of a Kind Luxury 12th scale dollshouse Christmas Tree decorated by hundreds of handmade ornaments in hues of red gold and green, that sway upon the slightest movement. This beautiful tree has golden bells, ruby red glass baubles, gold plated baubles, gold jewel encrusted baubles, jewel encrusted burgundy hearts dark green baubles, gold plated garland and topped ff with a twinkly golden star. 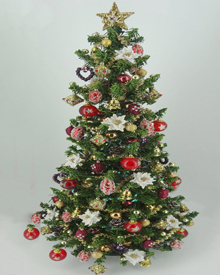 Approx 8.5" x 4.5"
Beautiful Heirloom “One of a Kind” Traditional Christmas Tree. 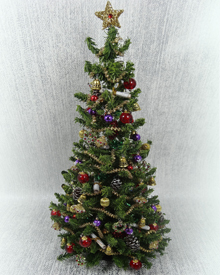 This adorable realistic Christmas Tree has been dressed in a theme of rich reds, greens, silver and golds. It has been completely handmade by the artist from start to finish, even the tree itself. 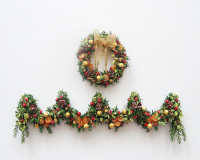 Having been painstakingly dressed with beautiful handmade gold plated baubles, silver plated baubles, gold plated garland, golden bells, silver and red glitter baubles, green and gold baubles, snowy tipped pinecone and topped with a twinkly silver star. The photo does not do this work of art the justice that this stunning tree deserves. 8.5” high x 4” wide PLEASE NOTE: Each one of our tree’s is priced not just the size, but what baubles it is has been dressed with. This glorious and completely handmade heirloom miniature 12th scale Christmas tree was made to celebrate the Kensington Dollshouse Festival 50th show. It is adored in rich regal colours of reds, mauves, golds and greens, with over 500 handmade and decorated and embellished Christmas baubles, bells, frosted white Poinsettias blooms, tint snowy pinecones, along with golden tinsel and topped with a twinkly star. This superb tree would take pride of place in any miniature resident. Measures approximately 9" x 4.25"
Realistic One of a Kind 9" Luxury Irish Blue Spruce Christmas Tree, in hues of green and silver. This fabulous 12th scale Christmas tree is adorned with hundreds of handmade ornaments that sway upon the slightest movement. To name but a few: Silver bells, silver plated baubles, green frosted baubles,green decorated cowbells, frosted pine cones, jewelled shamrocks, silver plated garland and topped off with a twinkly silver star. Height approx: 9" x 4.5"